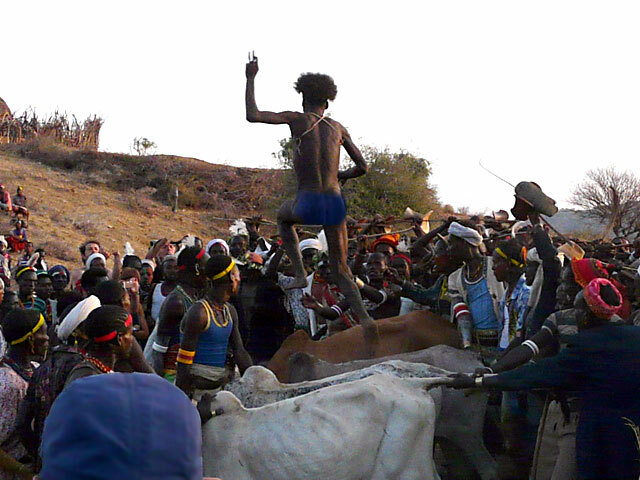 The Hamer (or Hamar) tribe has a famous ceremony involving bull jumping by young men about to marry. Other African tribes in the Omo Valley such as the Aari, Bashada, Tsamai, and Banna also practice this ritual. The bull jumping ceremony also involves his sisters and young female relatives being whipped with sticks before the actual jumping of the bulls takes place. The women willingly take part in the ceremony, even though they will be scarred for life. The ceremony tends to unite the family as if the woman ever falls upon on hard times, she can rely upon the man to help her. The scars on her back are said to be proof of her sacrifice for the man and it is therefore impossible for the man to refuse her needs in times of emergencies. Interestingly, the more scars that a woman possesses, the greater is her status in the Hamer tribal society by proving just how dedicated she is to her family. During the bull jumping ceremony, the bulls are held in place by men who have successfully completed the ceremony on previous occasions (the "Maza"). The "Maza" are responsible for holding the bulls in place and preventing serious injury to the man if he might fall. The man is required to transverse the bulls four times (two round-trip journeys). He must perform the bull jumping ceremony naked as is the tradition of the Hamer African tribe. If he should fail to jump over the bulls without falling, he will not be permitted to marry the woman of his choice and must wait another year to make another attempt. Moreover if the young man should fall, he will be whipped by the women. In addition to jumping bulls, the Hamer African tribe requires that the man pay the bride's family a dowry in the form of cattle. The bride and groom will then drink the blood of the cows mixed with milk. This African tribe is polygamous and one Hamer man can marry as many as four Hamer women.